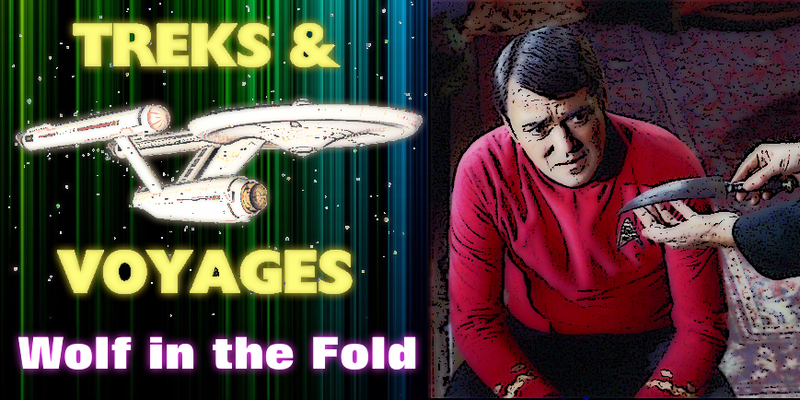 On this edition of 'Treks & Voyages' I re-watched the original series episode 'Wolf in the Fold' which aired on December 22, 1967 (so perfect choice!) and here I am to give my opinion on a few details of the episode! 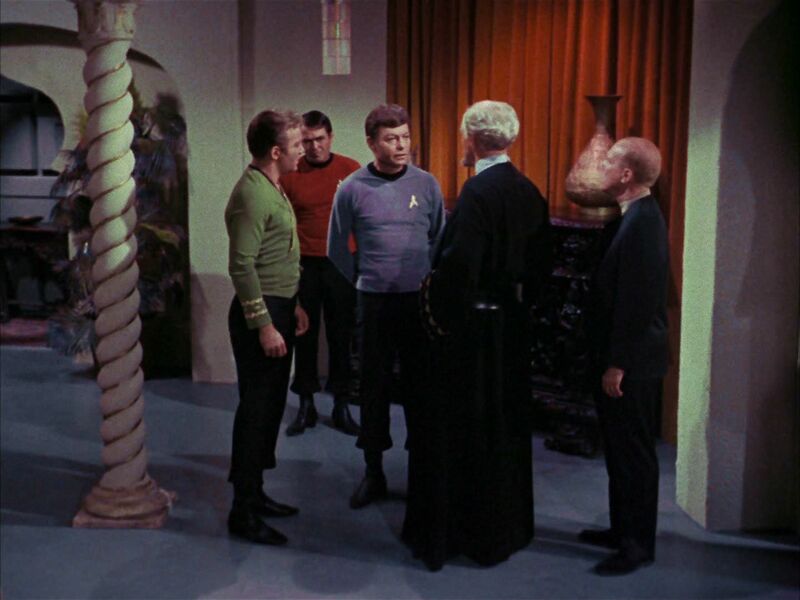 The episode in question: Wolf in the Fold, which was the 14th episode of season two for the Original Series. Because this episode is nearly 50 years, this isn’t going to be a total recap of it, just a review of certain things that I found interesting after doing a re-watch of it, much like how I go over episode of Doctor Who. 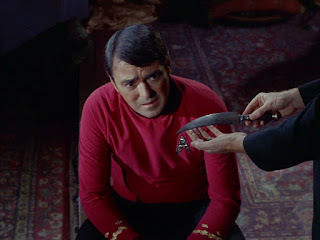 And with just the first few minutes before the opening credits, everything about this episode is established as a ‘Did He Do It?’ story, considering everything is focused on Scotty, and there is of course plenty of reasonable doubt to make the viewers think Scotty did it, with only one clue early on telegraphing who is the real culprit. You see the real culprit is Hengist an administrator on the planet and the only clue viewers get to him being the villain is when he’s leaving the Prefect’s home to bring other possible suspects there, Hengist stops and lingers to see Lt. Tracy beaming down, gives a smile and continues on his way. Add onto this the original murder weapon turning up missing from where it was and back in Scotty’s hands for when Lt. Tracy is killed, the revelation there was another way into the room where she and Scotty were and there being no way to tell if the lock was picked or not… and it’s real obvious Hengist is the killer… but with how the story is laid out, you don’t think about Hengist being the killer until it’s revealed that one of the words Sybo says ‘Beratis’ comes from Rigel IV, where Hengist says he’s from early in the episode and only then does the pieces fall in to place. Switching gears, let me smack down the regressive left who hate this episode: the handling of the female characters. This episode a murder-mystery with a serial killer on the loose who strikes certain kinds of victims, everything works in sequence with the story, it just happens to be all women that are killed. 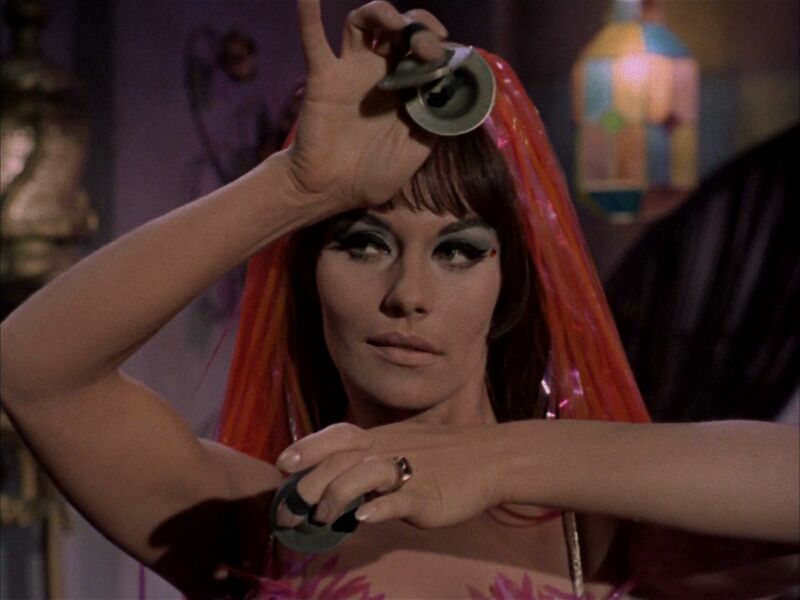 But because this is ‘Star Trek’ and it’s supposed to be ‘beyond’ objectifying genders to stereotypes, this episode ends up getting a bad reputation for being ‘Star Treks Women in Refrigerators Blunder’ which I think is totally unjustified, particularly when this was the first episode a female member of the Enterprise crew is ‘seen’ killed in the line of duty since Dr. Dehner in Where No Man Has Gone Before, the 2nd series pilot. Not to mention look at how the deaths were used, Kara’s was to introduce the plot, Tracy’s to put further suspicion on Scotty, and Sybo’s was just as she was giving vital information about the true danger, none of these character deaths were pointless in anyway. Now the other the issue of the therapeutic shore leave for Scotty I think in a way is bit of forward thinking, considering they say up front that the explosion that sent him into a bulkhead was caused by a woman and he was expressing resentment towards all women… so what we’re seeing is the aftermath of that as Scotty is not showing any signs of resentment. But when the story happens, McCoy and Kirk are obviously concerned maybe Scotty has relapsed in a dangerous manner so this help for the drama of the episode. 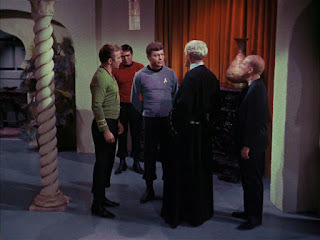 So the question is Argelius the right place to take him, probably not, but considering at this point on the Star Trek timeline, they didn’t have federation facilities all over the place and it was probably the best choice out of what was close-by, and sure the planet had an apparently loose ‘code’ of conduct, with the law of the land being ‘love’ is questionable… but hey it worked for the plot of the story and danger at hand, with the Hengist being a proverbial wolf among sheep as Spock pointed out. Beside... If this episode was done in the TNG era, Scotty would be sent to Troi for her useless psycho-babble and then be shipped off to some starbase where we’d never see him again. Anyway, those are my thoughts on this episode, but what did you think of Wolf in the Fold, leave your opinions in the comments section below. 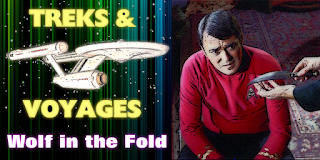 If you have suggestions for the next topic for Treks & Voyages, leave them in the comments section as well… subscribe to my channel, follow me on twitter… all that good stuff…. And what’s coming up in the Basement… well… tomorrow on my birthday it’s Tales from the TARDIS with part 2 of the Web Planet… and Talking Anime with episode 13 of Blue Seed… so till then my friends and you are my friends, have a good one!